Gard. Chron. 1922, Ser. III. lxxi. 65. Origin and Habitat: 45 km North East of Vaalwater, South Africa. Habitat and ecology: Lithops lesliei grows in fairly heavy rainfall area in gravel pockets in grassy places and in the summer and in winter is often entirely covered by grass to such an extent that the clump is not visible. It is rust-brown in the reddish soil from decomposed ironstone, containing coarse conglomeritic sandstone, brown shaly siltstone, quartzite, ferruginous quartzite, pegmatitic granite, fine-grained feldspathic sandstone, amygdaloidal lava, chert, shale, and banded jasper. The plants mimic the small, haphazardly arranged rocks that surround them. In habitat the plants grows embedded in the soil and can tolerate extreme hight temperature and only temperature that exceed 60° C are lethal. Lithops lesliei var. applanata (N.E.Br.) N.E.Br. Lithops lesliei var. luteoviridis (N.E.Br.) N.E.Br. Description: Lithops lesliei C029 (collected in the type locality: 45 km North East of Vaalwater, South Africa by Desmond Thorne Cole) is a local or morphological form of the widespread and variable Lithops lesliei. It differs from the type variety mainly for the dark rusty to olive-green-pink windowed top. 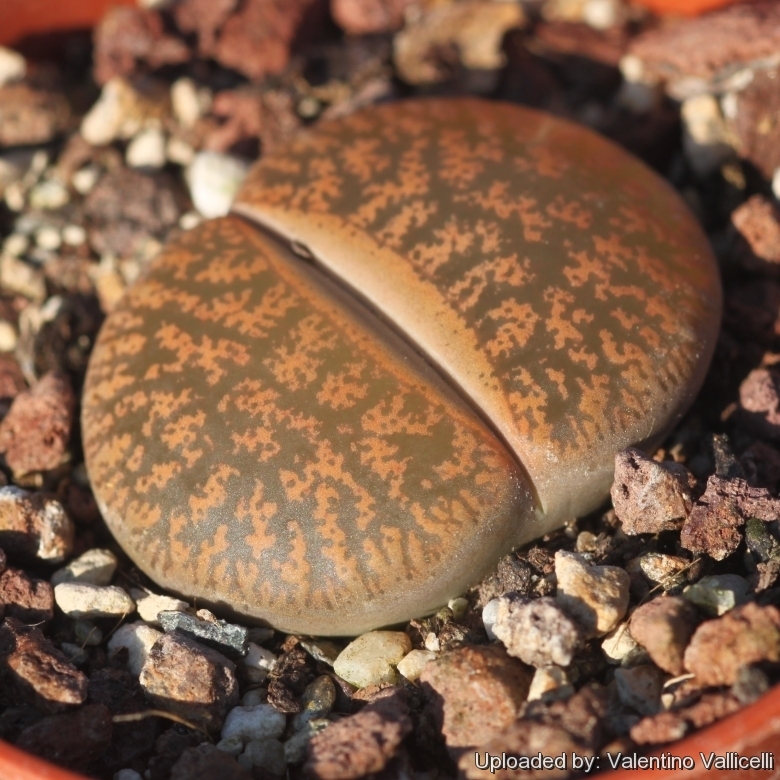 However the distinguishing characteristics of Lithops lesliei C029, appear to fall within the natural variation of Lithops lesliei and it should be synonymized with the latter, but it still has a value for a collector because they identify plants with particular characters. Lithops lesliei (N.E.Br.) N.E.Br. : (var. lesliei) Cole numbers: C014, C020, C028, C036, C026, C151, C344, C352, C358. Deep rusty brown with brown windows; flowers golden yellow. Lithops lesliei subs. burchellii D.T.Cole: Cole number(s):C302, C308. Distinguished from subsp. lesliei by colour and markings, and from var. venteri by the much finer meshlike markings and clavate marginal lines. Origin: RSA: CP, in small area NE of Douglas. It is probable that this subspecies occurs also in the military zone further to the NE, along the Vaal River. Lithops lesliei subs. burchellii C302 TL: 20 km NNE of Douglas, South Africa: highly branched lines. Lithops lesliei subs. burchellii C308 10 km NNE of Douglas, South Africa: beautiful form. Lithops lesliei C005A TL: Near Warrenton, South Africa cv. albiflora D.T.Cole: Extremely rare white flowering form, occasionally found in any one colony, but in all other respects the plants are indistinguishable from others in the same colony. They can therefore be identified only when in flower. Lithops lesliei C005 TL: (Warrenton Form) Near Warrenton, South Africa: brown spotted window. Lithops lesliei C007 15 km S of Johannesburg, South Africa: green bronze top. Lithops lesliei C009 (grey Form) 70 km W of Mafikeng, South Africa: rusty grey, jagged. Lithops lesliei C010 25 km SW of Lobatse, Botswana: lacy windows. Lithops lesliei C014 (Kimberley Form) 15 km NW of Kimberley, South Africa: transparent veined network. Lithops lesliei C020 (syn. luteoviridis) TL: 15 km W of Magaliesburg, South Africa: mysterious green shades. Lithops lesliei C026 60 km SW of Johannesburg, South Africa: rusty pink, olive green windows. Lithops lesliei C027 Near Bethlehem, South Africa: blue grey body, clear green windows. Lithops lesliei C028 10 km N of Harrismith, South Africa: brown background, jagged green veins. Lithops lesliei C029 45 km NE of Vaalwater, South Africa: dark rusty, olive-green-pink window. Lithops lesliei C030 (Pietersburg Form) 30 km NW of Pietersburg, South Africa: windows of opportunity. Lithops lesliei C031 10 km NE of Meyerton, South Africa: dark green windows. Lithops lesliei C032 (Pietersburg Form) 10 km SE of Pietersburg, South Africa: pinkish grey. Lithops lesliei C033 45 km E of Pietersburg, South Africa: pale green grey, very nice pattern. Lithops lesliei C036 (Warrenton Form) Near Warrenton, South Africa: rusty tinge. Lithops lesliei C036A TL: Near Warrenton, South Africa cv. albinica D.T.Cole: Distinctly translucent, grass green to yellowish sheen with yellow lines and patches. White flowers. Known only from one locality, CP. Lithops lesliei C036B Near Warrenton, South Africa cv. Storms Albinigold D.T.Cole: Distinctly translucent, grass green to yellowish sheen with yellow lines and patches with rich yellow flowers. It is indistinguishable from acf 'Albinica'. It can therefore be identified only when in flower. Lithops lesliei C115 5 km NW of Vryburg, South Africa: translucent green windows. Lithops lesliei C138 Near Benoni, South Africa: opaque pink-green jagged window. Lithops lesliei C151 (grey Form) 25 km NW of Christiana, South Africa: dark veined network. Lithops lesliei C341 (Kimberley Form) 20 km NW of Kimberley, South Africa: pale form. Lithops lesliei C342 10 km NE of Pretoria, South Africa: Chinese-red, nice. Lithops lesliei C343 Near Vanderbijlpark, South Africa: reddish, with tiny windows. Lithops lesliei C352 45 km E of Pietersburg, South Africa: coarse pale markings, distinctive. Lithops lesliei C354 (Kimberley Form) 15 km NW of Kimberley, South Africa: quite dark brown, lined. Lithops lesliei C358 25 km W of Lobatse, Botswana: jagged markings. Lithops lesliei C359 (grey Form) 115 km SW of Lobatse, Botswana: grey-brown surface. Lithops lesliei var. hornii de Boer: Cole numbers:C015, C364. Light ochre to rusty brown coloured body with greyish brown branching patterning. Yellow flowers. Endemic to a small area SW and S of Modderrivier. Lithops lesliei var. hornii C015 40 km SW of Kimberley, South Africa: jagged rusty brown window. Lithops lesliei var. hornii C364 TL: 45 km SSW of Kimberley, South Africa: rusty brown. Lithops lesliei var. mariae D.T.Cole: Cole numbers:C141, C152.Gold specled with clear, orangish body with many very fine, pinspots darker dots. Yellow flowers. Distribution: RSA: OFS, in a small area within the range of var. lesliei, to the W of Boshoff and N and NE of Kimberley. Lithops lesliei var. mariae C141 TL: 10 km SW of Boshof, South Africa: spattered, fine pattern. Lithops lesliei var. mariae C152 30 km NNE of Kimberley, South Africa: fine speckles and lines. Lithops lesliei var. minor de Boer: Cole numbers: C006. Yellow-brown to rusty brown, very similar to the typical form of var. lesliei, but consistently smaller and with slightly different markings. Yellow flowers. Distribution: RSA: Tvl, in a very small area to the SW of Swartruggens, thus within the range of var. lesliei. Lithops lesliei var. minor C006A 25 km SW of Swartruggens, South Africa cv. Witblom D.T.Cole: White flowering form. It is indistinguishable from the standar v. minor. It can therefore be identified only when in flower. Lithops lesliei var. minor C006 TL: 25 km SW of Swartruggens, South Africa: dark window, rust body, small. Lithops lesliei var. rubrobrunnea de Boer: Cole numbers: C017, C204. Differs from the type variety mainly for the red brow colour. Distribution: RSA: Tvl, within the range of var. lesliei, in a very small area W of Randfontein and Krugersdorp. Lithops lesliei var. rubrobrunnea C017 TL: 5 km NW of Randfontein, South Africa: reddish grey body. Lithops lesliei var. rubrobrunnea C204 5 km NW of Krugersdorp, South Africa: dark maroon top. Lithops lesliei var. venteri (Nel) de Boer & Boom: Cole numbers:C001, C047, C153. Grey body with grey black denticulate windows, like small worms. Yellow flowers. Distribution: RSA: CP, in a fairly narrow strip on both sides of the Harts River, extending NE from its confluence with the Vaal River near Delportshoop to a point near Taung. Lithops lesliei var. venteri C001 30 km NW of Warrenton, South Africa: grey-black top, intricate. Lithops lesliei var. venteri C047 TL: 30 km W of Warrenton, South Africa: margin veined. Lithops lesliei var. venteri C153 (syn. maraisii) TL: 60 km NW of Kimberley, South Africa: grey or black apex. Cultivation and Propagation: The Lithops (a.k.a. Living Stones) are some of the world's most fascinating plants and are sought by the collector of succulent plants. Paying attention to the particular growing requirement of Lithops is especially important. 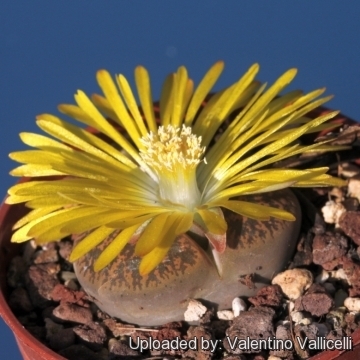 If you provide the Lithops with the right conditions, they will reward you with their unique shape, size, colour and a proliferation of blooms in autumn. However, Lithops are tricky plants that are very particular about their growing conditions and require the right maintenance in order to keep happy. But don't be afraid even the best growers have plants that mysteriously dry up, or leave during the night. While Lithops are picky about their care, if you are patient and remember the basics, your efforts will be rewarded. Being small plants, a representative collection can be grown on a patio table, a sunny windowsill or a shelf in the greenhouse. Growing rate: Slow growing for a mesemb. Soil: They grow best in an open mineral, sandy-gritty soil and requires good drainage as they are prone to root rot. They can grow outdoor in sunny, dry, rock crevices (protection against winter wet is required) They can also be cultivated in alpine house, in poor, drained soil. Repotting: They may stay in the same pot for many years. Plants grown in larger containers have frequently relatively poor flowers. Flowers might improve when the plants are given their own, small individual pots. Watering They Require little water otherwise the epidermis breaks (resulting in unsightly scars). The basic cultivation routine is: Stop watering after flowering. Start watering after the old leaves are completely dry (usually late March or Early April). Water freely during the growing season, soak the compost fully but allow it to dry out between waterings. In the winter season the plant doesn’t need watering, the plant in this time extracts water from the outer succulent leaves, allowing them to shrivel away, relocating water to the rest of the plant and to the new leaves that form during this period. If grown in a container, bottom watering by immersing the container is recommended. Water sparingly only when warm, no water when cold. Nearly all problems occur as a result of overwatering and poor ventilation, especially when weather conditions are dull and cool or very humid. They must have very dry atmosphere. Fertilization: Feed them once during the growing season with a fertilizer specifically formulated for cactus and succulents (high potash fertilizer with a dilute low nitrogen), including all micro nutrients and trace elements diluted to ½ the strength recommended on the label. They thrive in poor soils and need a limited supplies of fertilizer to avoid the plants developing excess vegetation, which is easily attacked by fungal diseases. Some growers fertilize frequently, some hardly ever. However, for the highly succulent mesembs, (Lithops, Conophytums, etc.) fertilization is not really necessary. Light: They prefer a very bright situation and in winter they need the maximum amount of light you are able to give them, but keep more cool and partially shaded in summer. The only exception to this is seedlings in their first year that enjoy a shades place. Such tiny plants can easily get scorched or broiled and their appearance spoiled (this may not matter in the wild, where the Lithops have probably shrunk into the ground and becomes covered with sands). Outdoor (Lithops prefer full sun, with some shade in the hottest summer months. High levels of light are needed in autumn to flower and for good plant development. The low intensity of sun light during the growing season of this species generally prevents the white flower flowers from opening. Special Advice: Lithops are best planted in a sunny and airy part of the greenhouse, and not too close to the glass roof or sides of the house as the plants can overheat during hot spells. Hardiness: They require a minimum temperature 5°C (But will take a light frost and are hardy down to -7° C for short periods if they are in dry soil). USDA zones 9A – 11. - Red spiders: they may be effectively rubbed up by misting the vulnerable plants every day. - Mealy bugs: occasianlly they develop aerial into the new leaves and flowers with disfiguring results, but the worst types develop underground on the roots and are invisible except by their effects. - Rot: it is only a minor problem with mesembs if the plants are watered and “aired” correctly. If they are not, fungicides won't help all that much. Remarks: After flowering in the autumn and extending through winter season the plant doesn’t need watering, but they will still be growing, the new bodies will be increasing in size extracting water from the outer succulent leaves, allowing them to shrivel away. In fact the plant in this time extracts water and nutrient stored in the outer succulent leaves, allowing them to dehydrate relocating the water to the rest of the plant and to the new leaves that form during this period until the old leaves are reduced to nothing more than "thin papery shells". Propagation: Seed or (or rarely) cuttings. The small seeds can be sown in pots of fine, well-drained sand, any time during the spring and summer months when temperatures are warm. Cover the seeds with a very fine layer of grit and water from below with a fungicide to prevent damping off. For the first 3-4 days cover the pots with a sheet of glass/clear perspex to keep the humidity levels high. Remove the glass and replace it with light shadecloth and mist once or twice a day for the next two weeks after which most seeds should have germinated. From then on mistings can be reduced to every second and then every third day as the little plants grow. Take the cuttings from a grown-up mother plant. Each cutting must contain one or more heads along with a fraction of root and permit them to dry out a couple of days, lay the cuttings on the soil and insert the stem end partially into the soil. Try to keep the cutting somewhat upright so that the roots are able to grow downward. It is relatively difficult to root Lithops from cuttings and generally pointless as well, so quick are they from seed. Comment: Improvement of Lithops characteristics: Some growers (but not all!!) think it is very intriguing to reinforce any characteristic of cultivated Lithops of by crossing two similar selected plants and then back-crossing with the mother plant. This way we can eventually get some interesting results. Of course, many of the nicest Lithops we grow in cultivation have already been selected over time. However many Lithops are already nice plants which can’t really be improved, on the other hand one could try to improve the colour or the markings etc. Now if we have two particular plants we may attempt to breed between them and can maybe get a whole improved population and then select some better offspring to continue the selection. Seed production: Plants can be hand pollinated, using a small paint brush. Remember always to cross different clones as the plants are self-sterile. The seed will remain viable for many years provided it is stored in a cool dry place.